Take your pick: A helicopter landing, a water arrival via luxury yacht, or roll up to the hotel in the back seat of a Rolls Royce Phantom…. 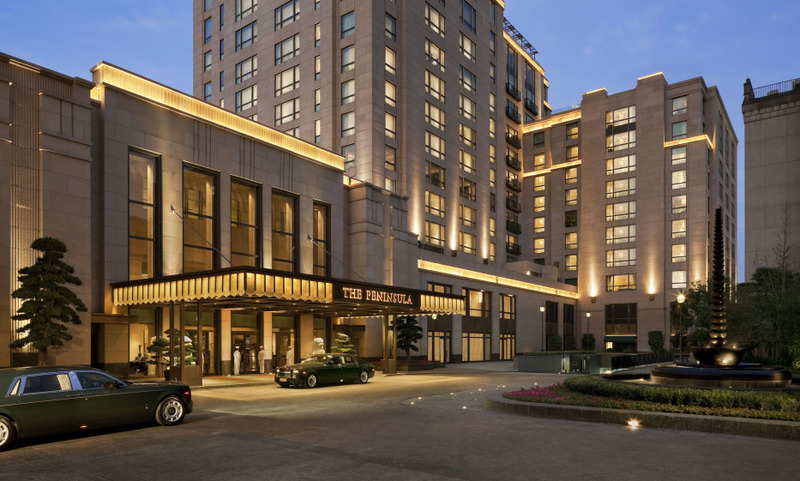 As first impressions go, few do it as well as the Peninsula Shanghai. The first major building built on the Bund since it’s steady re-gentrification, it’s hard not to see the Peninsula Shanghai as a symbol of a city that’s going places. And what a symbol it is. The lobby is grandiose ( picture high ceilings, chandeliers, and all smiles staff in pillboy hats ) without feeling overdone. The room designs are a modern take on Art Deco which pay homage to 1920’s Shanghai with plush carpets, royal blue or celadon green interiors and dark woods for the television cabinets and writing desks. Suite’s come with separate sitting areas, and those higher up the pecking order have terraces overlooking the Bund, along with private Jacuzzi’s and gym. All, offer exceptional views of the Huangpu and skyline. For one of the best night out’s in town, head up to the open air Sir Elly’s Rooftop Bar to admire 270 degree views of Huangpu River, Suzhou Creek and the Pudong skyline and host of the city’s movers and shakers shooting the breeze. Try a transfer with the hotel's own limousines including four Extended Wheel Base Rolls-Royces Phantoms and six BMW 7 Series long wheel base cars. Superb property and location. Exceptional rooms and customer service, especially in concierge and housekeeping. Great stores. Only recommendation is that some of the reception staff were not as fluent in English as they could be; all were courteous and customer-centric. Peninsula Shanghai is great traditional hotel and we could profit from an upgrad in a very nice suite with a wonderful view to the river. Just great experience.